The Oma Forest is a large modern work of art created by Basque painter and sculptor Agustin Ibarrola that is also known as “the painted forest.” Located outside of Guernica in the Urdaibai forest reserve, the work features dozens of Monterrey pine trees vividly painted with images of humans, geometric shapes, and animals. Nature is the artist’s canvas, and what you see depends upon where you stand. 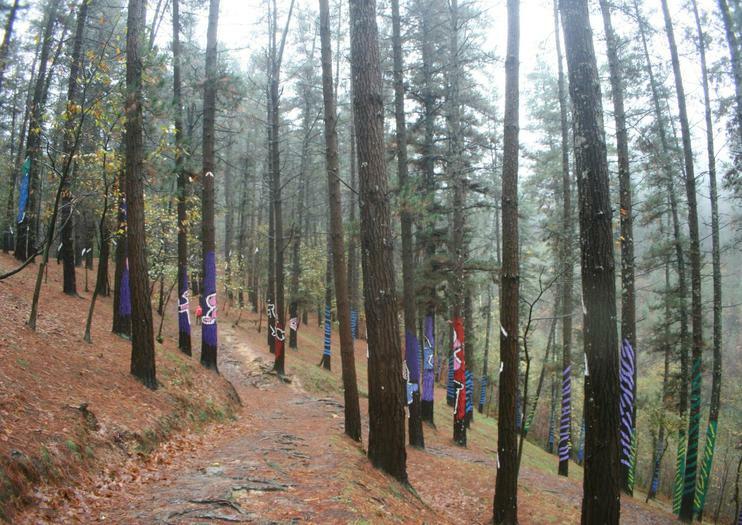 The colorful paints on the tree trunks express the relationship between man and nature, with some of the art only visible from certain vantage points. Seeing this alternative form and medium known as “land art” is a unique experience, where the arts jump to life in the middle of a Basque forest. Walking through the trees is a journey of shifting perspectives, as some works are visible on a single tree and others across several that appear only when viewed together. In this way, the visitor is active in shaping their own relationship to the art in an open-air museum. The Oma Forest is located in a forest just outside of Kortezubi. It is accessible from Guernica via car and train, or Bizkaibus runs a service to Kortezubi and you will then have to continue on foot for three kilometers. Admission is free.